This is a Chinese name; the family name is Tu (屠). Tu Youyou, Nobel Laureate in Physiology or Medicine, in Stockholm, December 2015. 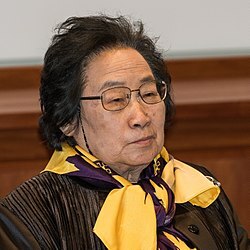 Tu Youyou (Chinese: 屠呦呦; pinyin: Tú Yōuyōu; born 30 December 1930) is a Chinese pharmaceutical chemist and educator. She discovered artemisinin (also known as qinghaosu) and dihydroartemisinin, used to treat malaria, a significant breakthrough in 20th-century tropical medicine, saving millions of lives in South China, Southeast Asia, Africa, and South America. For her work, Tu received the 2011 Lasker Award in clinical medicine and the 2015 Nobel Prize in Physiology or Medicine jointly with William C. Campbell and Satoshi Ōmura. Tu is the first Chinese Nobel laureate in physiology or medicine and the first female citizen of the People's Republic of China to receive a Nobel Prize in any category. She is also the first Chinese person to receive the Lasker Award. Tu Youyou was born, educated and carried out her research exclusively in China. Tu was born in Ningbo, Zhejiang, China, on 30 December 1930. My [first] name, Youyou, was given by my father, who adapted it from the sentence ‘呦呦鹿鸣, 食野之蒿’ translated as ‘Deer bleat “youyou” while they are eating the wild Hao’ in the Chinese Book of Odes. How this links my whole life with qinghao will probably remain an interesting coincidence forever. She attended Xiaoshi Middle School for junior high school and the first year of high school, before transferring to Ningbo Middle School in 1948. A tuberculosis infection interrupted her high-school education, but inspired her to go into medical research. From 1951 to 1955, she attended Peking University Medical School / Beijing Medical College. [note 1] In 1955, Youyou Tu graduated from Beijing Medical University School of Pharmacy and continued her research on Chinese herbal medicine in the China Academy of Chinese Medical Sciences. Tu studied at the Department of Pharmaceutical Sciences, and graduated in 1955. Later Tu was trained for two and a half years in traditional Chinese medicine. After graduation, Tu worked at the Academy of Traditional Chinese Medicine (now the China Academy of Traditional Chinese Medical Sciences[note 2]) in Beijing. Tu and her husband, Li Tingzhao (李廷钊), a metallurgical engineer, live in Beijing. Li was Tu's classmate at Xiaoshi Middle School. They have two daughters. Tu's maternal grandfather, Yao Yongbai (姚咏白), was the first Director of National Treasury Administration after its reform. Her uncle, Yao Qingsan (姚庆三), was an economist and banker. Tu carried on her work in the 1960s and 70s during China's Cultural Revolution, when scientists were denigrated as one of the nine black categories in society according to Maoist theory (or possibly that of the Gang of Four). During her early years in research, Tu studied Lobelia chinensis, a traditional Chinese medicine for curing schistosomiasis, caused by trematodes which infect the urinary tract or the intestines, which was widespread in the first half of the 20th century in South China. In 1967, during the Vietnam War, Ho Chi Minh, the leader of North Vietnam (which was at war against South Vietnam and the United States), asked Chinese Premier Zhou Enlai for help in developing a malaria treatment for his soldiers trooping down the Ho Chi Minh trail, where a majority came down with a form of malaria which is resistant to chloroquine. Because malaria was also a major cause of death in China's southern provinces, including Hainan, Yunnan, Guangxi, and Guangdong, Zhou Enlai convinced Mao Zedong to set up a secret drug discovery project named Project 523 after its starting date, 23 May 1967. In early 1969, Tu was appointed head of the Project 523 research group at her institute. Tu was initially sent to Hainan where she studied patients who had been infected with the disease. Scientists worldwide had screened over 240,000 compounds without success. In 1969, Tu, then 39 years old, had an idea of screening Chinese herbs. She first investigated the Chinese medical classics in history, visiting practitioners of traditional Chinese medicine all over the country on her own. She gathered her findings in a notebook called A Collection of Single Practical Prescriptions for Anti-Malaria. Her notebook summarized 640 prescriptions. By 1971, her team had screened over 2,000 traditional Chinese recipes and made 380 herbal extracts, from some 200 herbs, which were tested on mice. One compound was effective, sweet wormwood (Artemisia annua), which was used for "intermittent fevers," a hallmark of malaria. As Tu also presented at the project seminar, its preparation was described in a 1,600-year-old text, in a recipe titled, "Emergency Prescriptions Kept Up One's Sleeve". At first, it was ineffective because they extracted it with traditional boiling water. Tu Youyou discovered that a low-temperature extraction process could be used to isolate an effective antimalarial substance from the plant; Tu says she was influenced by a traditional Chinese herbal medicine source, The Handbook of Prescriptions for Emergency Treatments, written in 340 by Ge Hong, which states that this herb should be steeped in cold water. This book contained the direction to immerse a handful of qinghao in the equivalent of two litres of water, wring out the juice and drink it all. After rereading the recipe, Tu realised the hot water had already damaged the active ingredient in the plant; therefore she proposed a method using low-temperature ether to extract the effective compound instead. The animal tests showed it was completely effective in mice and monkeys. In 1972, she and her colleagues obtained the pure substance and named it qinghaosu (青蒿素), or artemisinin as it is commonly called in the West, which has saved millions of lives, especially in the developing world. Tu also studied the chemical structure and pharmacology of artemisinin. Tu's group first determined the chemical structure of artemisinin. In 1973, Tu wanted to confirm the carbonyl group in the artemisinin molecule, therefore she accidentally synthesized dihydroartemisinin. Furthermore, Tu volunteered to be the first human subject. "As head of this research group, I had the responsibility" she said. It was safe, so she conducted successful clinical trials with human patients. Her work was published anonymously in 1977. In 1981, she presented the findings relating to artemisinin at a meeting with the World Health Organization. For her work on malaria, she was awarded the Nobel Prize in Medicine on 5 October 2015. She was promoted to a Researcher (研究员, the highest researcher rank in mainland China equivalent to the academic rank of a full professor) in 1980 shortly after the Chinese economic reform began in 1978. In 2001 she was promoted to academic advisor for doctoral candidates. Currently she is the Chief Scientist in the Academy. Before 2011, Tu Youyou had been obscure for decades, and is described as "almost completely forgotten by people". Tu is regarded as the Professor of Three Noes – no postgraduate degree (there was no postgraduate education then in China), no study or research experience abroad, and not a member of any Chinese national academies, i.e. Chinese Academy of Sciences and Chinese Academy of Engineering. Tu is now regarded as a representative figure of the first generation of Chinese medical workers since the establishment of the People's Republic of China in 1949. October 2015, Nobel Prize in Physiology or Medicine 2015 (co-recipient) for her discoveries concerning a novel therapy against Malaria, awarded one half of this prize; and William C. Campbell and Satoshi Ōmura jointly awarded another half for their discoveries concerning a novel therapy against infection with roundworm parasites. ^ a b Peking University Medical School (北京大学医学院) became the independent Beijing Medical College (北京医学院) in 1952. Tu Youyou attended it between 1951 and 1955. Later in 1985 it was renamed Beijing Medical University (北京医科大学), and was returned to Peking University as Peking University Health Science Center (北京大学医学部) since 2005. ^ a b The Beijing-based Academy of Traditional Chinese Medicine (中医研究院) was established in 1955 and renamed the China Academy of Traditional Chinese Medicine (中国中医研究院) in 1985 and then the China Academy of Traditional Chinese Medical Sciences (中国中医科学院) in 2005. Tu Youyou has been working at the Academy since 1955. The Academy was subsidiary to the Ministry of Health and is now directly under the State Administration of Traditional Chinese Medicine. ^ "Introduction". Peking University Health Science Center. 27 October 2010. Archived from the original on 10 August 2014. Retrieved 10 October 2015. ^ "Youyou Tu – Facts". Retrieved 11 October 2015. ^ a b Miller, Louis H.; Su, Xinzhuan (2011). "Artemisinin: Discovery from the Chinese herbal garden". Cell. 146 (6): 855–858. doi:10.1016/j.cell.2011.08.024. PMC 3414217. PMID 21907397. ^ a b "Magic Drug Saved Half Billion People" (in Chinese). Hong Kong: Phoenix Television News. 16 March 2007. Retrieved 13 September 2011. ^ Neill, Ushma S. (3 October 2011) [September 12, 2011]. "From branch to bedside: Youyou Tu is awarded the 2011 Lasker~DeBakey Clinical Medical Research Award for discovering artemisinin as a treatment for malaria". Journal of Clinical Investigation. American Society for Clinical Investigation. 121 (10): 3768–3773. doi:10.1172/JCI60887. PMC 3195493. PMID 22059236. ^ "Youyou Tu – Biographical". www.nobelprize.org. Retrieved 22 April 2018. ^ Tom Phillips (6 October 2015). "Tu Youyou: how Mao's challenge to malaria pioneer led to Nobel prize". The Guardian. ^ a b c Strauss, Evelyn (September 2011). "Award Description". Lasker–DeBakey Clinical Medical Research Award. New York: Lasker Foundation. ^ "Lasker Award Rekindles Debate Over Artemisinin's Discovery". News.sciencemag.org. Retrieved 7 January 2014. ^ Brown, Geoff (2010). "Special Issue Artemisinin (Qinghaosu): Commemorative Issue in Honor of Professor Youyou Tu on the Occasion of her 80th Anniversary". Molecules. Retrieved 14 September 2011. ^ Tu, Youyou. "Acceptance remarks by Tu Youyou". Lasker–DeBakey Clinical Medical Research Award. New York: Lasker Foundation. Equipped with a sound knowledge in both traditional Chinese medicine and modern pharmaceutical sciences, my team inherited and developed the essence of traditional Chinese medicine using modern science and technology and eventually, we successfully accomplished the discovery and development of qinghaosu from qinghao (Artemisia annua L). ^ Weise, Elizabeth (12 September 2011). "'America's Nobel' awarded to Chinese scientist". USA Today. Retrieved 12 September 2011. ^ Guo, Jeff (6 October 2015). "How a secret Chinese military drug based on an ancient herb won the Nobel Prize". Washington Post. ^ Tu, Youyou (11 October 2011). "The discovery of artemisinin (qinghaosu) and gifts from Chinese medicine". Nature Medicine. Nature. 17 (10): 1217–1220. doi:10.1038/nm.2471. PMID 21989013. ^ "Official Biography" (in Chinese). China Academy of Chinese Medical Sciences. Archived from the original on 6 September 2011. Retrieved 14 September 2011. ^ 屠呦呦膺世界級醫學大獎 (in Chinese). Hong Kong: Wen Wei Po. Retrieved 13 September 2011. ^ Zou, Luxiao (6 October 2015). "Chinese Scientist Wins Nobel Prize in Medicine; China Hails the Laureate with Reflection". People's Daily. ^ 屠呦呦获拉斯克奖 评论认为离诺奖只一步之遥 (in Chinese). Sohu News. 13 September 2011. Retrieved 13 September 2011. ^ 屠呦呦：新中国第一代药学家 研发青蒿素 (in Chinese). Sohu News. 29 September 2009. Retrieved 13 September 2011. ^ a b c "Tu Youyou 屠呦呦". China Vitae. Retrieved 7 March 2012. ^ "Chen Zhili Congratulates Lasker Award Winner Tu Youyou". Women of China. 22 September 2011. Archived from the original on 6 October 2015. Retrieved 7 March 2012. ^ "Tu Youyou". Lasker Foundation. 12 September 2011. Retrieved 12 September 2011. ^ "Tu is awarded Outstanding Contribution Award by CACMR" (in Chinese). Xinhua News Agency. 15 November 2011. Retrieved 10 February 2012. ^ 吴菊萍屠呦呦获授三八红旗手标兵 (in Chinese). Sina.com News. 28 February 2012. Retrieved 7 March 2012. ^ Alpert Prize Recognizes Malaria Breakthroughs. Warren Alpert Foundation. 4 June 2015. Retrieved 14 June 2015. ^ "Nobel Prize announcement" (PDF). NobelPrize.org. Nobel Assembly at Karolinska Institutet. Retrieved 5 October 2015. ^ "Nobel Laureate Tu Youyou Becomes First Female to Win China's Top Science Award". Caixin. 10 January 2017. Retrieved 20 January 2017. ^ "屠呦呦、赵忠贤获2016年度国家最高科学技术奖 习近平颁奖". guancha.cn (in Chinese). 9 January 2017. Retrieved 9 January 2017. ^ "国家知识产权局专利检索及分析". www.pss-system.gov.cn. Retrieved 14 February 2019. Rao, Y.; Zhang, D.; Li, R. (2016). Tu Youyou and the Discovery of Artemisinin: 2015 Nobel Laureate in Physiology or Medicine. Singapore: World Scientific Publishing Co. ISBN 978-7-5046-6996-4. Tu, Y. (2017). From Artemisia annua L. to Artemisinins: The Discovery and Development of Artemisinins and Antimalarial Agents. Academic Press. ISBN 9780128116562.